Congratulations! You have charted your protagonist’s change throughout the worlds of your story. You now have a clear sense of the internal transformation that your plot will force your hero to make. What's more, you've completed one of the most critical steps in crafting the story line for your novel: Mapping out the arc of your protagonist’s internal change, from the Opening Image of your novel to the Final Image. - What's actually happening in the scene. Look at the example in the picture below to see what your index cards should look like. 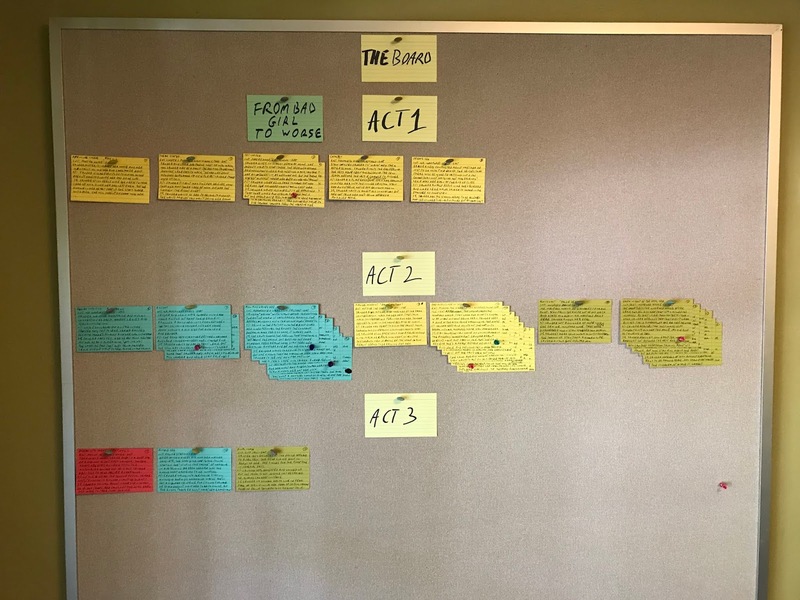 The benefit of creating scene cards for each of your story beats is that you can actually “see” the timeline of events in your novel. You can actually visualize your story. Writing out the beats on index cards helped me visualize my story through every stage of its development. What a huge benefit! 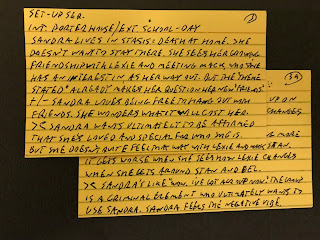 When I laid out the beats in their correct order according to the beats in the beat sheet for my young adult novel From Bad Girl To Worse, they showed me where my story logic was working, and where it was about to careen off the tracks. I laid out my scene cards according to which acts they happened in. What? Acts? What is an “act”? An act is where scenes and scene sequences happen. Plays, movies, and yes, even novels typically have a three-act structure. The breakdown is simple: Act One, Act Two and Act Three. Each of the story beats you outlined on your Blake Snyder beat sheet will happen in one of these three acts. You may recall the “Break Into Two” and “Break Into Three” beats on your sheet. These are known as “act breaks”. In these particular beats, something significant happens that forces the protagonist to take decisive, intentional action and rush headlong into the next act. Take a look at the picture below to see how I’ve laid out my index cards. Some of the beats actually represent scene sequences, where more than one thing happens during that beat. You'll want to write out a separate index card for each individual sub-event that happens, building the sequence. Take a look at this picture below to see an example. After you write out the individual events for the beat sequence, just place the cards under the main scene card for the given beat. 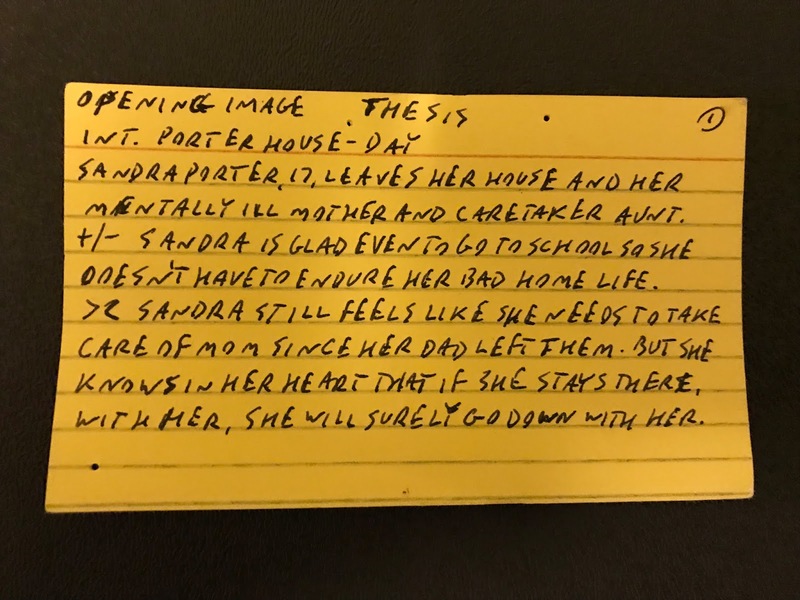 The great thing about using scene cards is that you can build the structure of your novel, helping you build the story it will ultimately tell. 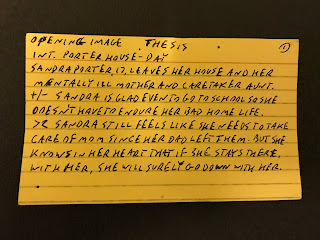 Hopefully you can see the great benefit of writing out your story beats or index cards and arranging them in the correct order in your story line. This exercise should help you catch any story flaws, gaps or things that just don’t make any earthly sense. In my next letter to you, we will take your story beats and break them down even further, and get to the very core of what motivates your protagonist to change over the course of the entire novel. P. S. – Many writers place their scene cards on a bulletin board with pushpins or thumbtacks. In Hollywood, and anywhere else writers are crafting great stories, they call it simply, “The Board”.